Through its full integration into the academic curriculum and afternoon programming, the Arts at Proctor affords each student the opportunity to explore an unparalleled breadth of offerings in the visual, performing, industrial, and media arts. Regardless of whether you are an accomplished artist or a curious novice, there is a place for you to continue or begin a study in the arts. Many may view an education in the arts as primarily the development of skills or technique in a particular focus but the habits formed during the process of creating art extend well beyond the walls of the rehearsal room or studio. Reserve Your Tickets for the Winter Play! 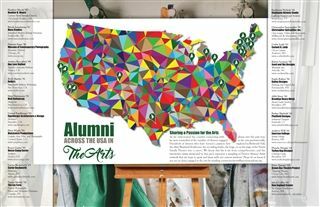 Today, we are proudly tracking the careers of more than 120 alumni/ae in the arts. Eighteen graduates are in television, film and theater (including Oscar-winning cinematographer Robert Richardson); sixteen are professional musicians (including rock star Matt Nathanson); fifteen are professional photographers, and fifteen enjoy careers in visual arts. Other alumni/ae are jewelers, ceramicists, sculptors, animators and fashion designers. Learn more about Proctor's woodworking, boat building, and metal engineering programs. Learn more about Proctor's digital graphics, image editing, digital video, web design, and media design utilizing programs. 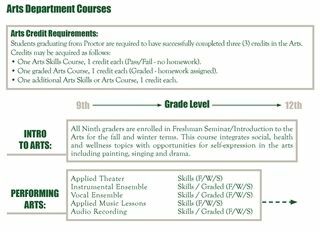 Learn more about Proctor's drama, instrumental and vocal music, dance and audio recording programs. Learn more about Proctor's studio art, ceramics, photography, sculpture, industrial and creative design, and textile programs.